This is the story of my grandparents' wedding. I wrote this in 2006 following an interview with my grandmother. I have added some notes from the Candeau genealogy. The engagement was celebrated on 28 May 1948, in the parental household. During this meal, Phuong Lan received her engagement ring. The purchase of this ring had not only engulfed all of Yves' meager savings but also a large part of his future salary. Since her father had maintained that she should adopt her husband's religion, Phuong Lan, originally a Buddhist, was submitted to an accelerated training into the Catholic religion. The civil ceremony took place in Hue town hall, on the morning of 26 June 1948. In the afternoon, the young couple received their nuptial benediction before presiding over a late lunch with their guests. For the occasion, the bride was decked out in traditional, ceremonial Vietnamese dress. Her hair was tied into a bun and crowned with a turban of yellow color. As in China, this color was restricted to the imperial family. My grandmother’s marriage to a Frenchman was opposed by many. The Vietnamese had a name for those Europeans who abused their country. They were called les petits blancs (the little white men). This derogatory stereotype while initially designating a sample of the European population in Vietnam, soon enough applied to the majority. Not surprisingly, and even today and all over the world, unchallenged negative schema continue to exist. To put it bluntly, the French were the enemy. And as such, it was out of the question that any marital alliance between a well respected family, as that of my grandmother, should be forged with the enemy. On top of this was the general bitterness that the Vietnamese felt and which originated from one’s country being invaded and colonised by a foreign people whose civilised status was very much in question. As evinced by their perceived licentious lifestyle, their lack of respect for women and their cultural differences, as far as most locals were concerned, les petits blancs were anything but civilised. To add fuel to the prejudice, my grandmother’s family knew of several incidences where Frenchmen, seemingly devoted to a local woman with whom they shared a de facto relationship while in the country, would nevertheless abandon her once they left Vietnam. Quite logically, it was supposed that my grandmother would meet the same fate once my grandfather decided to return to France. She would be abandoned. 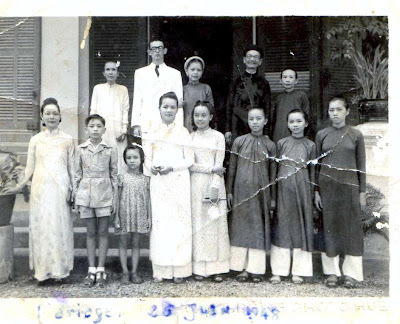 To return to our story, both French friends and the large Vietnamese family had been invited on this, the wedding day. But... the word had been given in the local community that attending Phuong Lan’s wedding would be to condone her behaviour and usher in a new era of rebellious young women who’d wed who they like with no regard for the family honour. On 26 June 1948, it soon became apparent that my grandmother’s family was greatly outnumbered by the petits blancs. Most of the attendees were French. Phuong Lan’s various aunts, uncles and other relations had conveniently found themselves in some inextricable complication or illness and could not attend... They made dutiful contributions through the dispatching of gifts and cards but attend the ceremony, they did not. While my noble grandfather would have tried to calmly absorb the general rejection with his detached melancholy air, all the while possibly cracking jokes and smiling ear to ear, my grandmother was deeply hurt. Her special day was not ruined because after all, she loved her new husband, but there was bitterness. On her wedding day, she could count her supporters on her fingers and they included: her father, her younger step-brother, her two cousins who, being part of her younger generation had perhaps a more lenient social attitude, and herself. Back Row: Yves and Phuong Lan. Her father (with the glasses) is on the right with her step-mother. It was the beginning of reckoning and social loss for my grandmother. She remembers that a couple of days after her wedding, she was walking in the streets of Hue and caught a glimpse of her close friend approaching on the footpath. They had been to boarding school together for 4 years. Her friend, like many others, had not attended the wedding ceremony. But wanting to give her the benefit of the doubt, and with forgiveness in her heart, my grandmother tried to make contact. As they neared each other and upon mutual recognition, her friend thought it most proper to avoid conversation with a social misfit and took great care to cross the road to the other footpath. Years of friendship lost to social convention and fear. To this day, these friends have never spoken again. And they have lost touch. My grandmother excuses her friend’s behaviour, saying that her father was later murdered by the Viet Cong. It may be that her friend’s reluctance originated from political fear. Fear of relating, even indirectly, to a Frenchman, a foreigner, in times when the Viet Cong were rapidly gaining supporters. Les Nuits Masquées is French for "The Masked Nights". So you want to look young, huh?